Braun Silk-épil 7 vs. Philips Satin Perfect: Which Epilator Is Best To Buy? We’ve already compared two Braun epilators to each other, SE7921 Spa vs. Silk-épil 7. In this post, we’ll be comparing our preferred choice, the Silk-epil 7 to Philips Satin Perfect. As both epilators are priced exactly the same (at the time of writing), we need to look at each feature to decide which epilator offers the best value. Braun Silk-épil 7 vs. Philips Satin Perfect, What’s The Difference? The Philips Satin Perfect feature 32 hypoallergenic, textured ceramic discs. The Silk-Epil 7 features 40 tweezers. Both epilators features pivoting heads, built-in light and speed settings. The Satin Perfect features a washable head, but it DOES NOT operate under water. The Silk-epil 7 is suitable for wet or dry use. It can be used under water in the shower. Both offer 40 minutes of cordless operation and 1 require of charging. The Satin Perfect includes 3 caps for trimming, shaving and style. It also includes luxury tweezers with built-in light, a massage system, active hair lifter and a storage pouch. The Silk-epil 7 includes: Shaver Head, Trimmer Cap, Sensitive-Area Cap, Facial Cap, Efficiency Cap. It also includes pre-epilation wipes and a storage pouch. Click here to learn more about the Philips Satin Perfect Epilator, read the customer reviews and buy it. 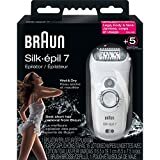 Click here to learn more about the Braun Silk-epil 7, read the customer reviews and buy it. The two epilators are quite close in features to each other. What would make a huge difference to you is the wet and dry feature of the Braun Silk-epil 7. If you plan to use your epilator in the shower, then this would be your best choice.